Trio hybrid comes with Windows 8, Android, two Intel CPUs and a battery life of up to 15 hours. 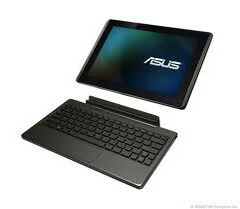 ASUS is well known for their Transformer hybrids, a line of devices that alternate between notebook and tablet functionality. The latest addition to the family was just unveiled at Computex 2013 in Taipei, and the company has managed to pack two operating systems into one package. Based around an 11.6", 1080p tablet running Android, the Transformer Book Trio has a physical hotkey that allows switching into a Windows 8 environment once the keyboard dock is connected. This function is powered by two CPUs found on the inside, a Haswell Core i7-4500U for Windows and an Atom Z2580 for Android Jelly Bean. Each half of the Trio also has its own storage, with a 750GB HDD and a 64GB SSD found on the inside. Of course, two operating systems also means an increase in power consumption, which is remedied by a pair of batteries, 33Wh and 19Wh for the Windows and Android portions respectively. ASUS has yet to announce any pricing or release info for the Transformer Book Trio, but we hope to have more info soon enough. Computex, Taipei, Taiwan (3 June, 2013) - ASUS today announced incredible new products at it's "We Transform" Computex 2013 press event that transform consumers' expectations about technology. Chairman Jonney Shih revealed the ASUS way of Design Thinking and introduced an entire line of innovative devices designed to simplify today's digital lifestyle. "We seek to perfect the balance between engineering and humanity, where every intricate detail echoes our needs for both emotion and function," said ASUS Chairman Jonney Shih. "This is the ASUS way of design thinking, where every idea starts with people and we turn our imagination into a myriad of revolutionary innovations." The ASUS Transformer Book Trio is an innovative combination of notebook, tablet and desktop PC for unparalleled flexibility in work, play, and social activity, while the new Transformer Pad Infinity is the world's first NVIDIA® Tegra® 4 tablet with a stunning 2560 x 1600 resolution display. ASUS also announced the 6-inch FonepadTM Note FHD 6 tablet with 3G voice-calling, the 7-inch MeMO Pad HD 7 value tablet with an MSRP of US$149, the ultra-compact VivoPC desktop, VivoMouse, a wireless mouse with built-in multi-touch touchpad designed to optimize Windows 8 experience, and the world's first AC1900 router, RT-AC68U. The ASUS Transformer Book Trio is the world's first three-in-one mobile device. With an 11.6-inch detachable display and dual operating systems, Transformer Book Trio transforms mobile flexibility by switching effortlessly between a Windows 8 notebook, Android tablet and Windows 8 desktop PC. Transformer Book Trio switches easily between operating systems to give users access to over 700,000 apps in the Google Play Store and over 50,000 apps in the Windows Store. Despite the different operating systems, the Transformer Book Trio has been designed to smoothly transition between modes, allowing users to sync data or continue to surf the webpage they're on even when moving from notebook to tablet mode. The PC Station dock has its own 4th generation Intel® Core™ i7 processor, keyboard and 750GB hard drive, and with the tablet display detached, can be hooked up to an external display for use as a desktop PC. The PC Station also serves as a charger for the tablet for extended battery life. The tablet features a 2.0 GHz Intel® Atom™ processor and a 16:9 aspect ratio IPS display with Full HD 1920 x 1080 resolution and up to 64GB storage.